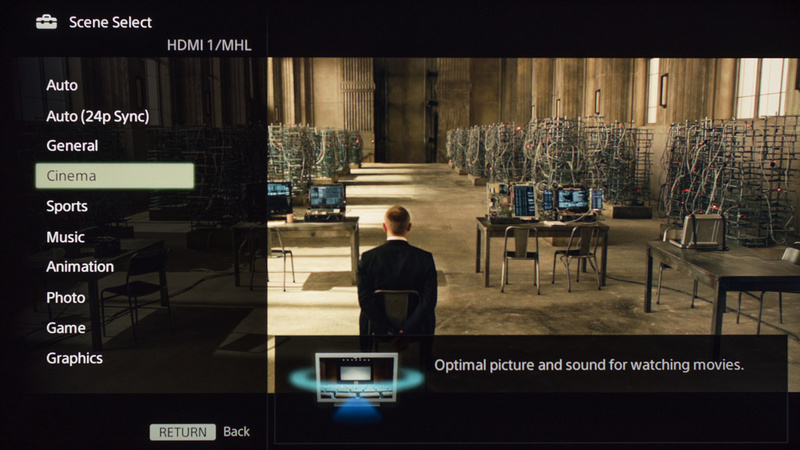 The following pictures represent the settings we used for the Sony W630B. These settings are best for watching movies. 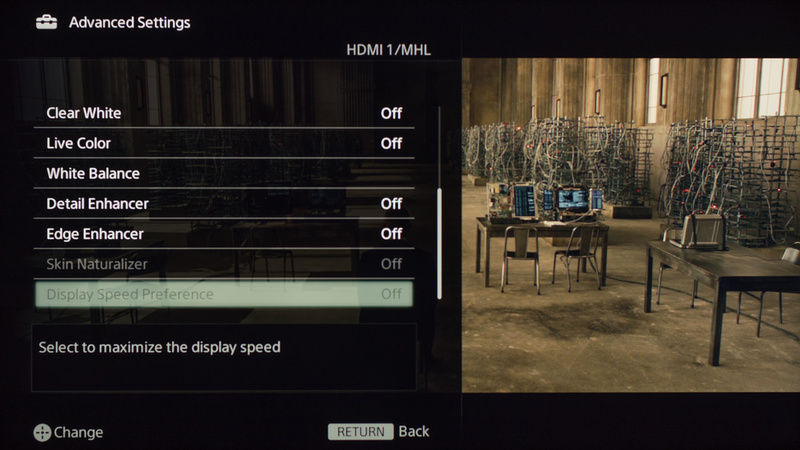 For playing video games, first change the 'Scene Select' setting to 'Game' before copying the remainder of the settings below. This will provide the lowest input lag. 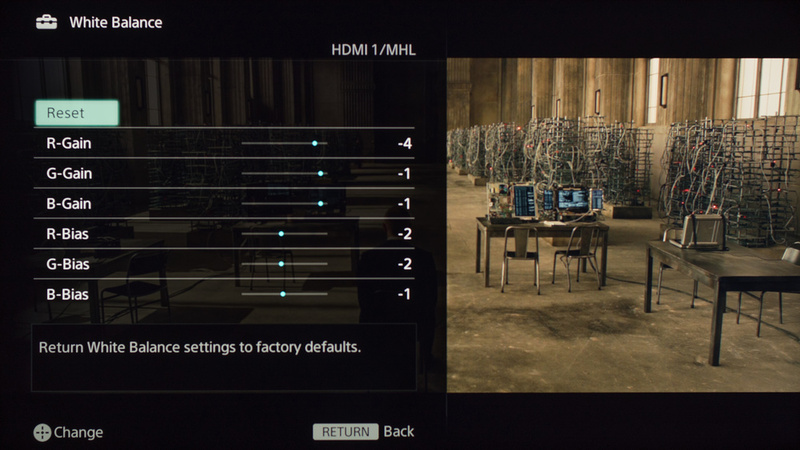 For use as a PC monitor, change the 'Scene Select' setting to 'graphics' to enable chroma support for clear text. 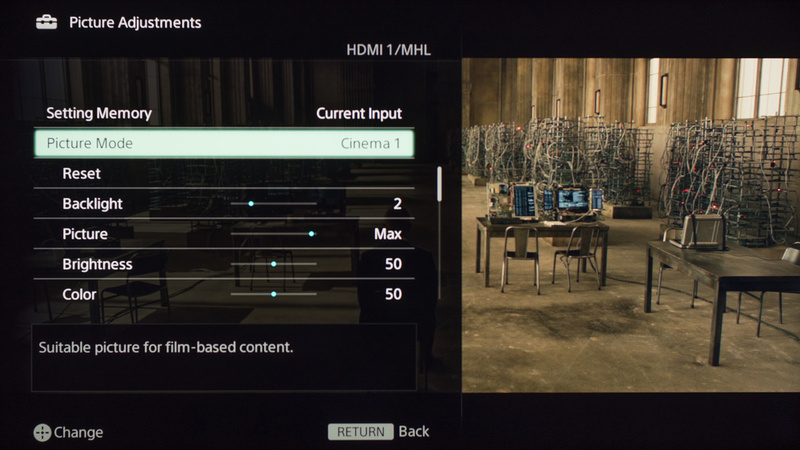 To begin, we use the 'Cinema' in the 'Scene Select' option so we can have access to all of the 'Picture Adjustment" settings. In picture mode, we selected 'Cinema 1' since it is the closest to our calibration setting. The backlight was set to 2 so we could have the closest to our 100cd/m² standard white brightness; in that case 112.9cd/m². 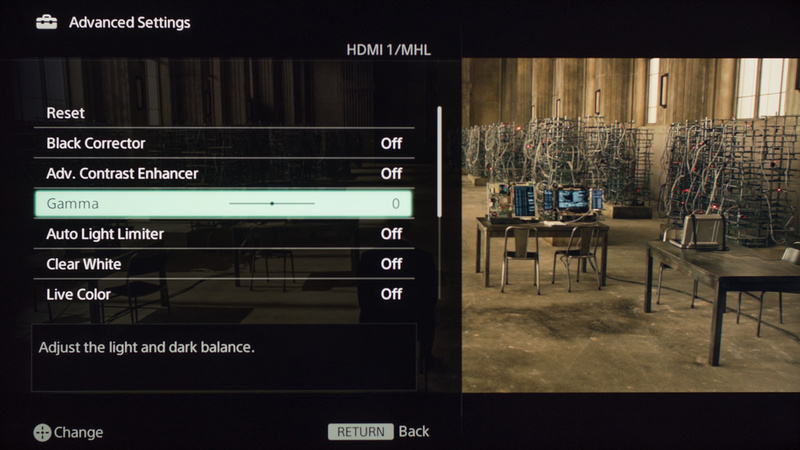 Remember that you can set this to your preference depending on the amount of light in your room and it won't affect the color calibration. 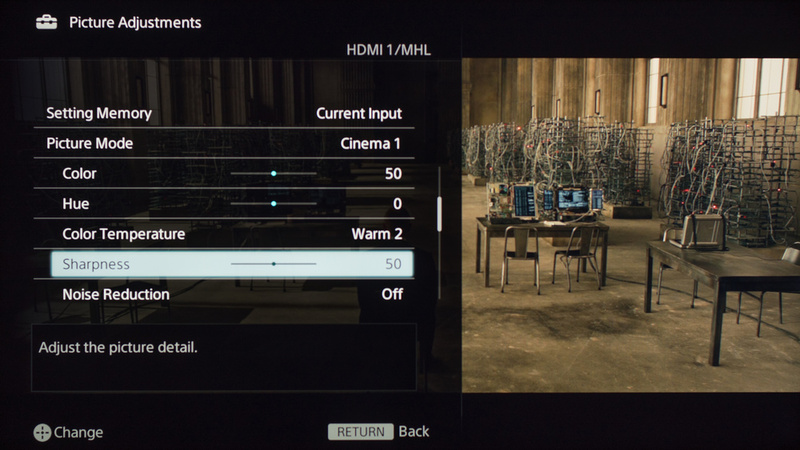 The color temperature of Warm2 was the closest to 6500K and the sharpness is set to 50 like for other Sony TV. This does not add any sharpness. To have a picture as close to the original as possible, we disabled all the image processing. MotionFlow is the setting that you want to play with to reduce the amount of blur / interpolate frames (soap opera effect). In advanced settings, everything is off. Some people might prefer to decrease the gamma a bit if you find the blacks are crushed. A value of 0 is the equivalent of 2.2. If you plan on watching 480p or broadcast 720p content, don't do this. You might want to turn a few of these on, like the edge enhancer. The white balance was not bad by default. It only needed a little bit of tweaking. You can try copying our values for these, but we don't recommend them as they vary per individual unit, so they might not be good, even for the same model and same size as the TV we reviewed. If you want to try them you will need to enter all values shown, as all of them are active at the same time. If you end up with worse picture quality, simply reset them to the default values. 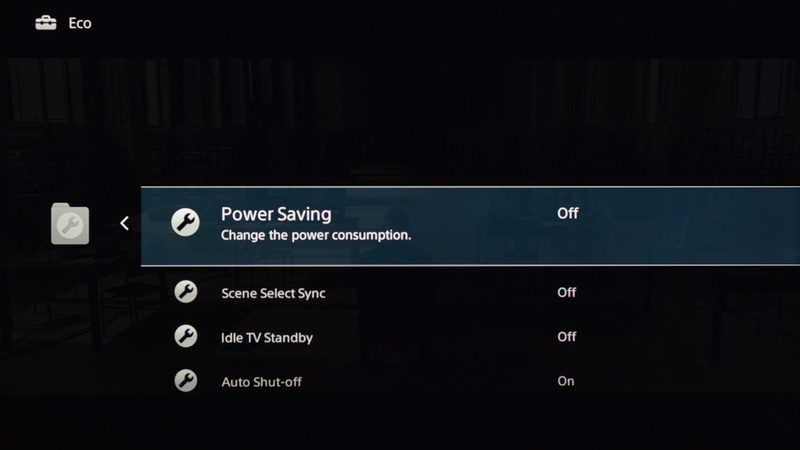 We disable the 'Power Saving' mode to have the best performance.